—The event is open to the public. For more information, call Jim Diehl at 824-6868. See how the Festivus idea was made famous in the classic "Seinfeld" episode "The Strike" from 1997. 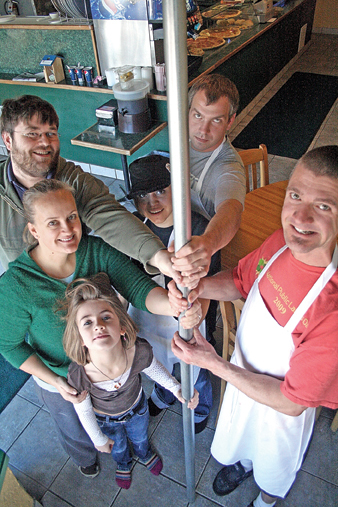 Friends and employees of Carelli’s Pizzeria & Pasta gather around the Festivus pole Wednesday. The restaurant, 465 Yampa Ave., will host a Festivus Party from 5 to 9 p.m. Thursday. Pictured above, clockwise from bottom left, are Jessie Diehl, Jenny Jones, C.J. Skowronski, Emily Weber, Eric Daszkiewicz and Jim Diehl. Jim Diehl, owner of Carelli’s Pizzeria & Pasta, surveyed the dining area of his restaurant Tuesday morning. Diehl then pointed to a table near the front door. With his index finger, he traced an imaginary line from floor to ceiling. “I think I’ll put it there,” he said. Diehl was speaking of a 10-foot galvanized pole he’d recently purchased. The pole, Diehl explained, is for Festivus. From 5 to 9 p.m. Thursday, Carelli’s will host a Festivus Party. It will be the restaurant’s inaugural celebration of the unorthodox holiday. “This is our first time, so I don’t really know how we’re swinging it, dude,” said Diehl, 36. Festivus is a relatively new idea. It was invented by Dan O’Keefe and first celebrated in February 1966 in Chappaqua, N.Y., according to the New York Times. O’Keefe created the occasion to mark the anniversary of his first date with his wife. For more than 30 years, Festivus was nothing more than a family tradition. However, in 1997, O’Keefe’s son, Daniel, introduced the holiday to a much larger audience. Daniel was a writer for the television show “Seinfeld.” Festivus is portrayed in the episode, “The Strike,” which originally aired Dec. 18, 1997. Festivus, according to “Seinfeld” character Frank Costanza, is a non-denominational holiday “for the rest of us.” It is presented as a stark alternative to the garish commercialization of Christmas. Instead of Christmas carols or gift giving, Festivus features such traditions as “the airing of grievances” and “feats of strength.” Instead of a Christmas tree, there is a Festivus pole. “We’ll have the airing of the grievances,” Diehl said. “So, people can write down on a sticky note how they’ve been disappointed over the past year, and they can stick it on our Festivus pole. However, the feats of strength are a work-in-progress, Diehl said. “We’re open to any ideas for feats of strength, if people want to call in,” he said. Current possibilities include crabwalk races or throwing contests. “If I pay the dishwasher enough, he might let us throw him,” Diehl said. The restaurant will also offer drink specials. Diehl said there was no particular inspiration behind starting a Festivus tradition at Carelli’s.